For those of you who like a bit more comfort but still want that Top End experience then we'd recommend a luxury private tour. All luxury tours are finely tailored to suit your exact needs. 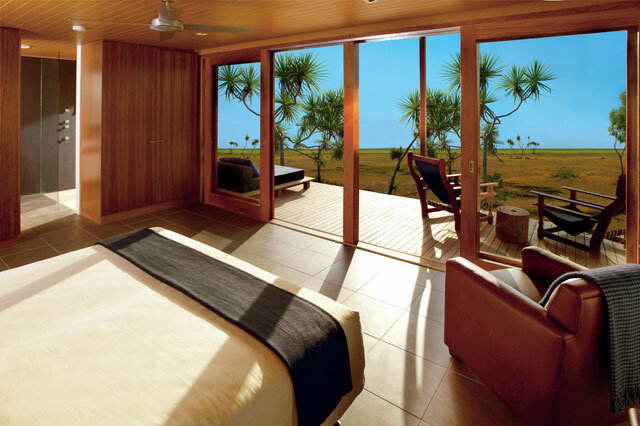 Wildman can be found halfway between Darwin and Kakadu National Park. They offers two styles of accommodation including cabins and our favorite their lavish safari tents. Located in western Arnhem Land Mt Borradaile offers very comfortable cabin accommodation but it's not the rooms people come here for...Mt Borradaile is home to rich wildlife, spectacular scenery and world class rock-art. Tours are all inclusive. Katherine has long been in need of some better accommodation and here it is...Cicada Lodge provides stylish rooms within walking distance of Katherine Gorge. In addition to great accommodation while on tour, Venture North can offer some very exclusive itineraries. We have access to various areas of the NT others don't. We have permits to take guests throughout Arnhem Land where Indigenous culture is at its strongest. We are the only operator on the pristine Cobourg Peninsula where we have our exclusive camp. We even have access to some permitted sites in Kakadu National Park other operators can't enter. While touring you will travel with an expert tour guide/driver in a luxury 4WD. We operate late-model Landcruiser Sahara 4WD’s (leather interior, superior suspension and icy cold a/c) and frequently use helicopters and light planes as part of itinerary. For more information or to organise a tailored luxury tour for your party please click here.